Above: Art Bus visitors at Tangentyere Artists with coordinator Joanna Byrne. On my first weekend in Alice I visited the art galleries in Todd Mall to start my exploration. I’d already put aside money to purchase my first Aboriginal artwork, but no impulse buys from me – I wanted to get to know Alice and her surrounds before I purchased her art. 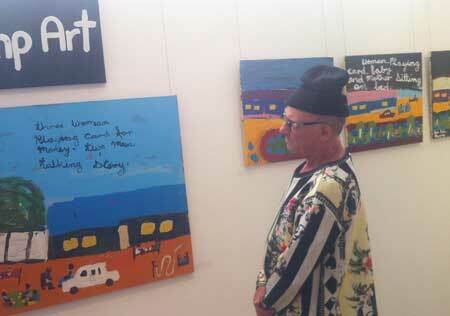 The opportunity came when I got on the Art Bus leaving at regular intervals from the Beanie Festival last Saturday. The initiative is a great one, Alice Springs’ not-for-profit, Aboriginal-owned art centres working together to further promote their work. They’ve called themselves the Alice Springs Aboriginal Art Precinct and the hop-on, hop-off Art Bus took me and some 80 other art enthusiasts and tourists off the beaten track to visit Tjanpi Desert Weavers, Tangentyere Artists – which was also hosting Ngurratjuta Many Hands – and Yarrenyty Arltere Artists. I am an art enthusiast. In fact, I own more art than walls and there is barely enough space in my rented share house to display all my pieces. So my room has become an exhibition space – I rotate my art depending on my mood and on the place to which I’d like to be transported. I’ve always enjoyed the story behind the art and when I travel I often prefer art to my own photographs for capturing the sense of a place. In some ways I find the subjectivity of art more truthful. I get to see the culture through the artist’s lens, rather than projecting myself onto that culture through my own photographic lens. I want to know how the artist interprets their culture and their environment. I want to know what it means to them. For me, art is a way in. First stop is Tjanpi Desert Weavers, located at the NPY Women’s Council in Wilkinson Street in Alice’s industrial area. “In some sense we are one the wrong side of the tracks as far as tourists are concerned,” Karina Menkhorst, Tjanpi’s sales and marketing director, says. We speak about what art means to the Tjanpi communities – a long way from town, in the far north of South Australia – how it is income generating, gives a sense of pride and enterprise and builds community. The premises in town provide office space and a retail outlet (open Monday to Friday, 10am-4pm), not an art centre as such. Most of Tjanpi’s work is created in the artists’ homelands, although a group of weavers who live in town for health reasons do come together there once a week. Whether in town or on their country, the practice for the weavers, apart from its income generation, is therapeutic and meditative. And so it is that I feel my first impulse to purchase – I get the story and want to take hold of something that has been created from this transformative process. Next stop, Tangentyere Artists around the corner in Fogarty Street, in their handsome new gallery and studio space, formally an industrial warehouse. 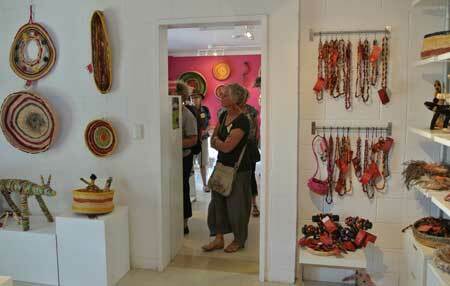 These artists come from the town camps of Alice Springs. Here, the conversation shifts from artists to consumers. I learn that buying Aboriginal art has had a tainted history, with some artists being exploited and paid significantly less than the value of their work. The best-known case is that of Albert Namatjira, one of Australia’s most famous artists. His works are valued at tens of thousands yet he died a poor man and to this day his family have not benefited from his acclaim as you would expect, with up to 90% of his royalties going outside of his estate. Perhaps it’s the idea that artists can be paid by the hour that shocks me the most, one hour $25, ten hours $250 and so on – their art a commodity and ‘costed’ by the amount of labour that goes into it. What about the many years the artist has worked on developing their practice, the thinking and creativity behind the piece? It’s for this reason that I always look to pay a fair price. Whilst the art I buy gives me aesthetic pleasure, I also enjoy the thought that my purchase values the artist and supports the arts as an income generating option. Iris Bendor agrees. She is the manager of Ngurratjuta Many Hands, artists painting in the Hermannsburg landscape tradition, whose works were on display at Tangentyere. “Not all galleries are dodgy,” she says. Whilst some private galleries do give artists 50% commission, art centres are not-for-profit and everything they earn goes to supporting artists and the art program. “Art centres are invested in much more than economic return,” Byrne says. Tangentyere Artists is committed to celebrating and maintaining the artists’ culture, Indigenous employment and social justice. The centre has a large studio and garden, offers professional development for artists, practical support, such as transport to and from the town camps and lunch, and a gallery open to visitors, Monday to Friday, 10am-4pm. While I’m there, art collector Brian Tucker (below right) makes a purchase. Old man waiting for kangaroo tail, his wife cooking kangaroo tail and three grandson waiting for tail. Mother sitting with the baby on the bed. Three woman playing cards for money. Two men talking story. This and other works at Tangentyere make me question my own preconceptions about Aboriginal art. Before arriving, what I’d imagined buying was a dot painting using a traditional earth-toned palette. But here, at Tangentyere Artists, I realise this is no longer the kind of piece I want. I am attracted to the evidence here of re-invention and unbounded creativity. The final stop is Yarrenyty Arltere Artists on the Larapinta Valley Town Camp. You can visit here by appointment (89537207), Monday to Thursday, 9am-2pm. I am greeted by excited children, “Come, come, come!” they say with pride, “come and see.” One of the girls playfully takes my phone to take photos of me. “Welcome”, the women round the campfire say. There is something very ordinary and funny about this exchange, and the other visitors like me get caught up in the laughter. After a full day, I ask some of the other people on the Art Bus what they thought of the experience. This is from one of a group of tourists from Point Lincoln. At Tangentyere Chris Leech was just as mesmerised as I by the artwork. She sat in the gallery for over an hour deliberating over the second piece she would buy. We discussed how different pieces related to and complemented the first piece she’d purchased. We could have talked ourselves into a hole – but the final decision would not be based on a rational choice. She was waiting to be moved, waiting for a piece to speak to her. And in the end it did. 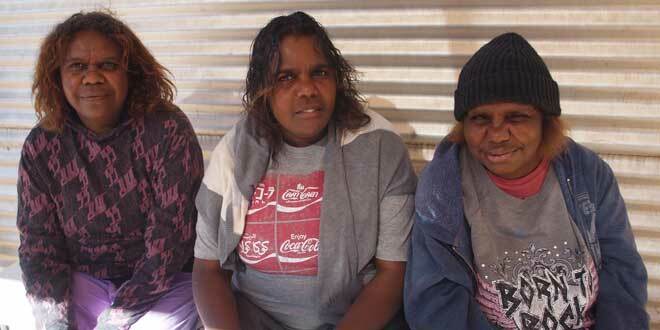 Below, Tangentyere Artists: Louise Daniels, Noreen Tilmouth and Rhonda Napanangka.